The evolution of the WestJet Rewards program continues with their first ever (to our knowledge) bonus offer for using a WestJet partner. Most bonuses from WestJet have been for flights and not much else. We've seen the addition of earning partners (WestJet Hotels, Cars, and American Airlines) but all those avenues have not seen bonuses until now. 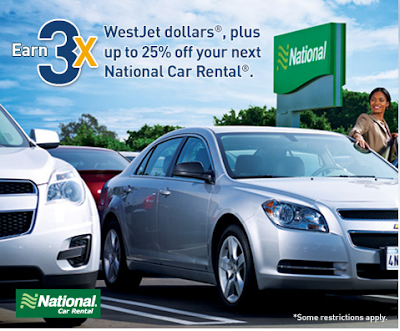 While it is not a true promotion from National Car Rental itself (if it was you could book this on National's site to earn the bonus Dollars) it is nice to see WestJet expanding the earning opportunities for its Rewards members. In fact this exact topic has come up on numerous occasions when we have had lunch with the WestJet Rewards team and that topic is more partners and more offers from those partners!